So what got me thinking about NaNoWriMo. Blogging friend Widdershin is taking part and what inspired her was creating a book cover on PULP-O-MIZER. She was not kidding, it is fun making a book cover. That up there is mine. Try it yourself. Here's the link. Sometimes one has to just dive in and start. I say or write it easily enough but I still have to follow it. I am more of dipping my toes slightly in and taking them out and doing this back and forth for a half hour before I go in. That's true. I shouldn't be scared about diving in. If that is your passion, go for it. You can DO it. Passion is the key word. I shouldn't think so hard about it. Susieee Mac ... that is BRILLIANT!!!!!!! 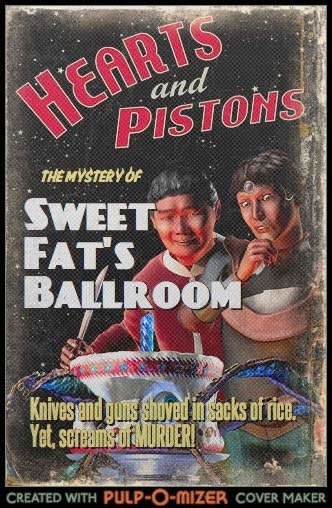 I've begun channeling Sweet Fat's Ballroom. We'll see how it goes.